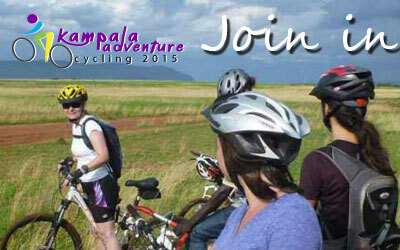 With less than a month to go, enthusiastic cyclers in Uganda are putting together the items they will need for a memorable tour on two thin wheels; which will take place on the 16th of August 2015, in what has been titled, “Kampala Adventure Cycling”. The event has been primed by Palms Travel Bureau backed by the Uganda Tourism Board (UTB) to offer bikers a whole new way to experience the beauty of Kampala’s modern, historic and cultural establishments. The only few things that interested parties will need is their cycling gear and a good level of fitness, coupled with the desire to come out victorious at the end of the circuits. They have laid out two courses; one over a road distance of 12 kilometers, while the longer one ascends and descends through the city for 25 kilometers. All routes will start at the KCCA sports ground (in Lugogo) wheeling along the fine tarmac of the Lugogo bypass and then making a left turn at the Kira Road Police Station. They will then continue past the market in Kamwokya and then make optional stops at the Uganda Museum for medication and refreshments. This will be the only major stop point along the expedition. With glucose and water running through their bodies, adrenaline will be back on top and the animated bikers will continue past the Mulago roundabout until they reach the Ministry of Public Service where the shorter route will take a left turn while cyclers interested in the more challenging leg will continue past Wandegeya to cross Sir Apollo Kaggwa road and then continue to Nankulabye. On the 12 kilometer route tourists will be able to see the Independence Monument and they will also cycle past the Kololo Airstrip; which is the official grounds for Uganda’s annual Independence Celebrations. On the longer route, riders will make an excursion to the Kasubi Royal Tombs; the most popular burial grounds for the fallen Kings of Buganda Kingdom. They will also ride to the majestic Namirembe Cathedral, the palace of the Kabaka of Buganda on Mengo Hill and also trundle past the Mukwano Industries; which is one of the biggest producers of household utilities in Uganda like cooking oil, bar and powder soap and several plastic materials. Both itineraries will expire at the KCCA sports grounds. All the moments from the start to the climax will be captured by an expert team of photographers, and bikers can be assured of a couple of “Say Cheese” moments. With recreation at the fore front and a humanitarian cause in the background, the organizing committee intends to use the proceeds from the entire adventure to support the lives of about 300 children living in Uganda’s maximum security prison in Luzira. Most of these kids have entered into this world within the boundaries of the prison while others have had to join their parents because of the unavailability of help outside. They need beds, clothing, food and above all medical aid. With kind giving hands, Palms Travel Bureau believes that these little adorable folks can live to see a better tomorrow. So cycle for fun, while claiming your seat in the wave of change. Many public and private sector sponsors have come in to support this positive endeavor including the Kampala Capital City Authority (KCCA); Uganda Cycling Association; Uganda Wildlife Authority (UWA); Mountain Dew; and tight security will be guaranteed by the Uganda Police Force. Let’s go 16th August, 2015.